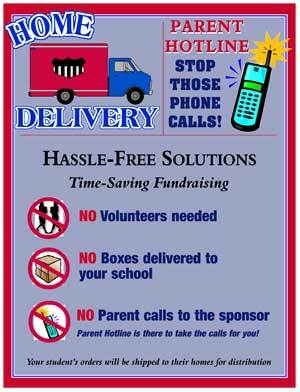 The Mega Event® offers Home Delivered Fundraising Programs! Our Home Delivery Program is perfect for organizations that do not have space to unload a truck full of boxes. Maybe you have a difficult time getting volunteers to help with your programs. Or, maybe you just don’t care to do all of the extra delivery work involved in a successful fund raiser! Whatever the case may be, we offer some of our fundraisers with Home Delivery. With this program we will pre-pack each participants order and send it directly to their home or business address! No need to unload the truck, organize boxes in the cafeteria, wait around until everyone remembers to come pick up their orders, etc. Best of all, you won’t have to find space for all the orders that were not picked up! Everything else is the same – just no hassles at school on the delivery day! Home delivery is a great option offered by The Mega Event®. Make sure you ask about this wonderful service. © 2019 The Mega Event, Inc.